As a beginning learner of English, you might find that grammar concepts such as indefinite articles, relative pronouns, the passive voice, or gerunds can be confusing. To go forward with your English skills, you need guidance through tricky grammar areas. 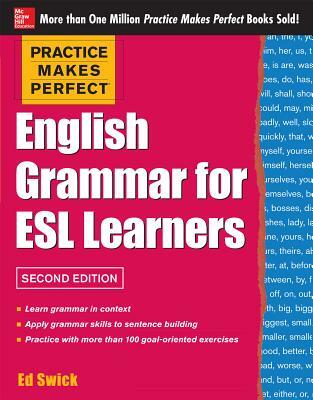 That's where "Practice Makes Perfect: English Grammar for ESL Learners" comes in. "Practice Makes Perfect: English Grammar for ESL Learners" offers a complete overview of English grammar using concise, easy-to-understand language. It will help increase your confi dence writing and communicating in English. Thanks to the proven Practice Makes Perfect format, you will polish your English grammar skills in no time at all.